crockpot | This Girl’s Gotta Eat! This beauty is brought to us by Cuisine’s Slow Cooker Menus and is perfect for a hectic weekday! This can be set up the night before, or in the morning before you head out. And when you get home dinner is done with just a few finishing touches, such as serving with a side of This Girl’s simple roasted potatoes and green beans. Heat oil in a saute pan over medium-high. Brown roast on all sides, 10 minutes total. Transfer roast to a 4-to-6-qt slow cooker. Stir flour into the pan; cook 1 minute. Add tomato paste and cook 1 minute more. Deglaze saute pan with wine, cooking until liquid evaporates. Stir in broth and worcestershire; bring mixture to a simmer, scrapping up any browned bits. Transfer broth mixture to the slow cooker; add onions, carrots, celery, garlic, thyme and bay leaves. Cover and cook until meat is fork-tender, on high heat setting for 4-5 hours or on low-heat setting for 8-9 hours. Discard thyme sprigs and bay leaves before serving. For the potatoes and green beans: Preheat oven to 450 degrees. Cube 4 medium-large potatoes (I used red skinned) for every 2 people. Put potatoes in a zip lock bag and drizzle with olive oil, garlic powder, thyme, rosemary and salt and pepper. Seal bag and toss around until well coated. Place on a non-stick baking sheet and roast for 15 minutes. Next, add a handful of fresh green beans (per person) and toss with potatoes. Roast for another 15 minutes, check to make sure the potatoes and green beans are done – if not – roast a few minutes longer. For the gravy: Remove the meat from the slow cooker and set aside. If the sauce seems to thin, heat 1 Tbsp unsalted butter in a medium saucepan, and when melted stir in 1 Tbsp flour and cook for a few seconds, next strain sauce into the rue (flour and melted butter mixture). If the sauce is thick enough, just strain it right into a saucepan without making a rue. Cook the sauce until thick like gravy, taste and season with salt and pepper as needed. Keep the onions and carrots set aside from what you strained to serve along with the meat if desired. 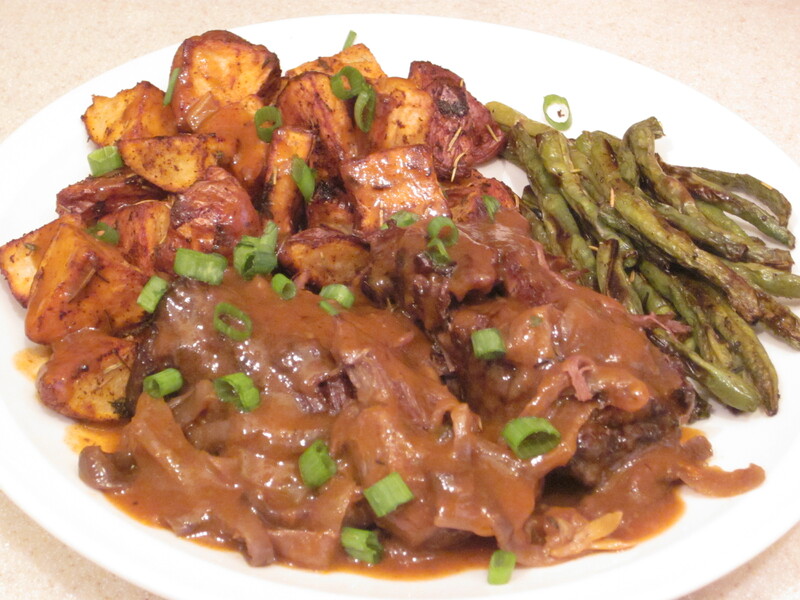 Serve pot roast alongside potatoes, green beans and cooked onions and carrots if so desired. Top with gravy and garnish with green onions or chives.